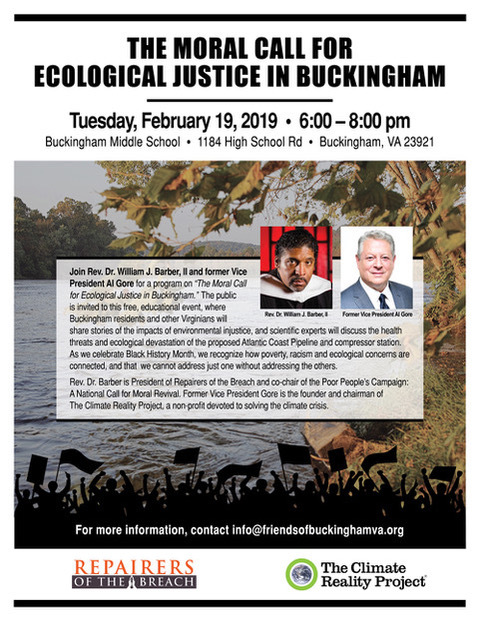 Tuesday February 19, 2019, 6:00-8:00 pm, Buckingham Middle School, 1184 High School Road, Buckingham, VA 23921. Join Rev. Dr. William J. Barber, II and former Vice President Al Gore for a program on “The Moral Call for Ecological Justice in Buckingham.” The public is invited to this free evening event, where Buckingham residents and other Virginians will share stories of the impacts of environmental injustice, and scientific experts will discuss the health threats and ecological devastation of the proposed Atlantic Coast pipeline and compressor station. As we celebrate Black History Month, we recognize how poverty, racism and ecological concerns are connected, and that we cannot address just one without addressing the others. The event is FREE, but please REGISTER HERE so organizers can plan appropriately. This entry was posted in Citizen Activism, Compressor Stations, Environmental Impact, Environmental Justice, Events on February 14, 2019 by Ellen Bouton.